I love shopping over at BH Cosmetics. They carry a vast assortment of beauty products that are not only affordable, but pretty good in quality too. I haven't been disappointed yet. Today I am going to be sharing with you all what I picked up in my recent BH Cosmetics order, and my thoughts on the products. Smooth Canvas Long-Wear Shadow Primer: When it comes to eyeshadow primer, I rely on my trusty Painterly Paint Pot from MAC. I saw that BH Cosmetics released their own line of shadow primers so naturally, I was intrigued. There are four shades in the lineup (pink, peach, yellow, and a white shimmer). 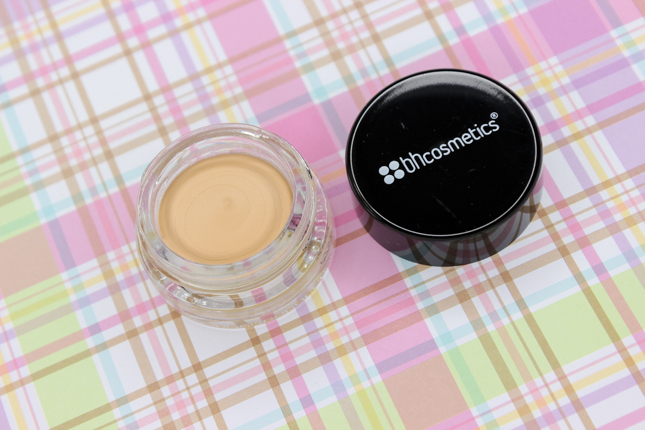 I decided to try out Bisque, a pale yellow that I knew would be great to help cancel out any redness and discoloration on lids-an issue of mines. This shadow primer definitely exceeded my expectations. It' super pigmented, long wearing, makes my eyeshadow colors pop, and it does a nice job at correcting the brown discoloration on my lids. Texture-wise, I felt like this had a thicker consistency than MAC's Painterly Paint Pot. But by no means does the texture take away from it's ability to blend with ease. I totally recommend this shadow primer if you are looking for an affordable dupe to MAC's Paint Pots. Neon Pink 6 Piece Brush Set + Cosmetic Bag: Confession-this travel brush set and bag were the culprit of my online BH Cosmetics order. The fact that the brush handles were neon pink made this set pretty hard to pass up on. The inclusion of the accompanying neon pink bag didn't make it any easier either. 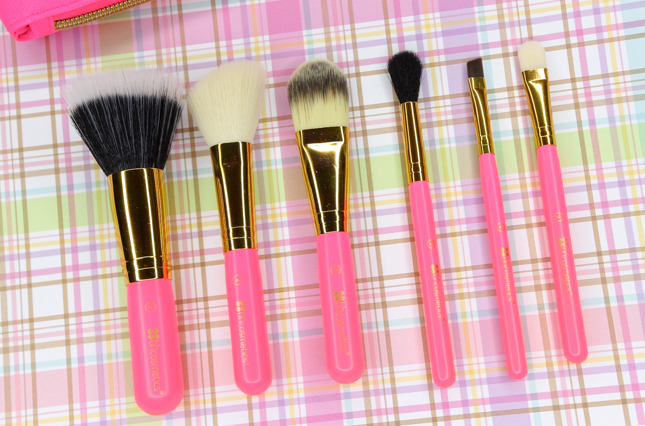 I am pretty picky when it comes to brushes, so I wasn't sure how I would feel about these. But so far so good. The synthetic brush hairs feel soft against my skin, and I love how the brushes are each multi-use. I haven't seen any shedding going on either, which is a plus. * Dual Fiber Powder Brush--Blends out liquid foundation effortlessly for a flawless finish. * Angled Contour/Highlight Blush Brush--Great for powder bronzer, contour, and blush application. * Foundation Brush--I apply my liquid foundation with this brush before I blend it out with the dual fiber powder brush. * Eyeshadow Blending Brush--This brush does a nice job at blending out crease colors. I do wish it was a little fluffier, though. * Angled Liner & Brow Brush--Awesome for applying gel eyeliner. Works great with eyebrow gels/pomades too. * Eyeshadow Brush--Nice to pack shadow on lids. 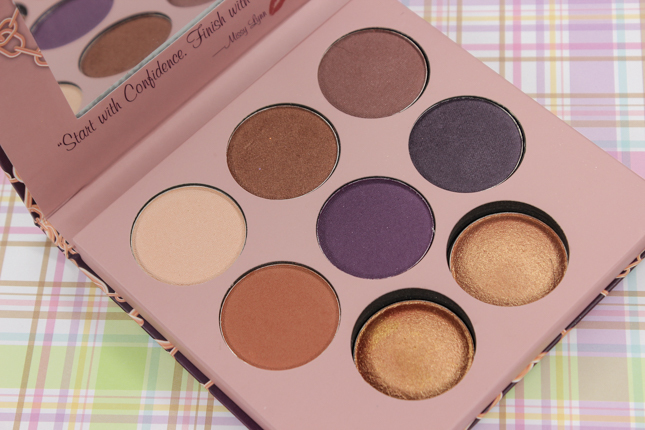 Missy Lynn Eyeshadow & Baked Highlighter Palette: Missy Lynn is one of my favorite beauty gurus on YouTube and I have always wanted to try her eyeshadow and highlighter palette, which contains six generously sized eyeshadows and two highlighting powders. 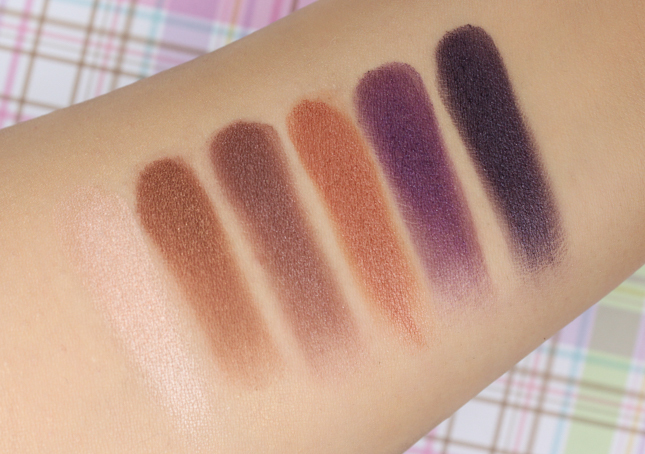 The eyeshadows are super pretty, and the colors range from warm browns to purples. It's easy to create a neutral day look with these satin shadows, as it is a glam smokey one for night. The shadows are nicely pigmented, are soft in texture, and I found them easy to blend. They are a little powdery though, and I did experience some fall-out with a couple of the shades. Definitely consider doing your eye makeup first rather than your face makeup when using these shadows, for an easier clean up. 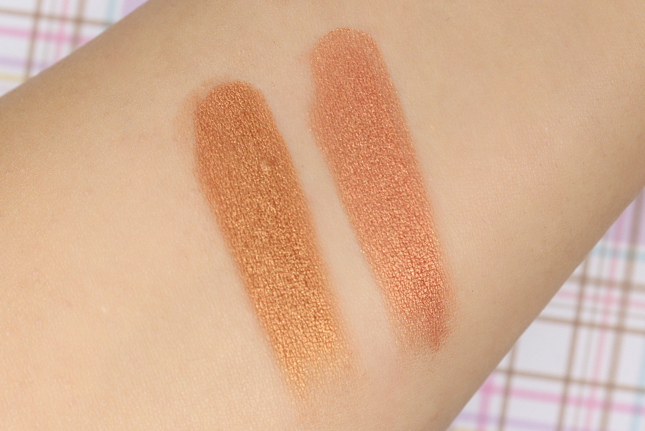 The two bronze golden baked highlighters can be used on both the eyes and face. They are both smooth to the touch, pigmented, and give off a beautiful luminous finish that doesn't look overdone. I like to use them on top of my cheekbones and inner corner of the eyes for a bright pop. Which are your favorite BH Cosmetics products? Anything I should try? Let me know!